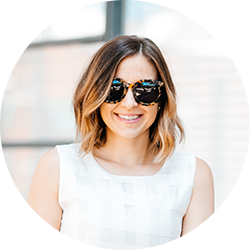 Anna Cobbs is a speech pathologist, blogger, and full-time mom to 3 and 5 year old daughters. Like every mom, she wears many hats and navigates a jam-packed schedule. 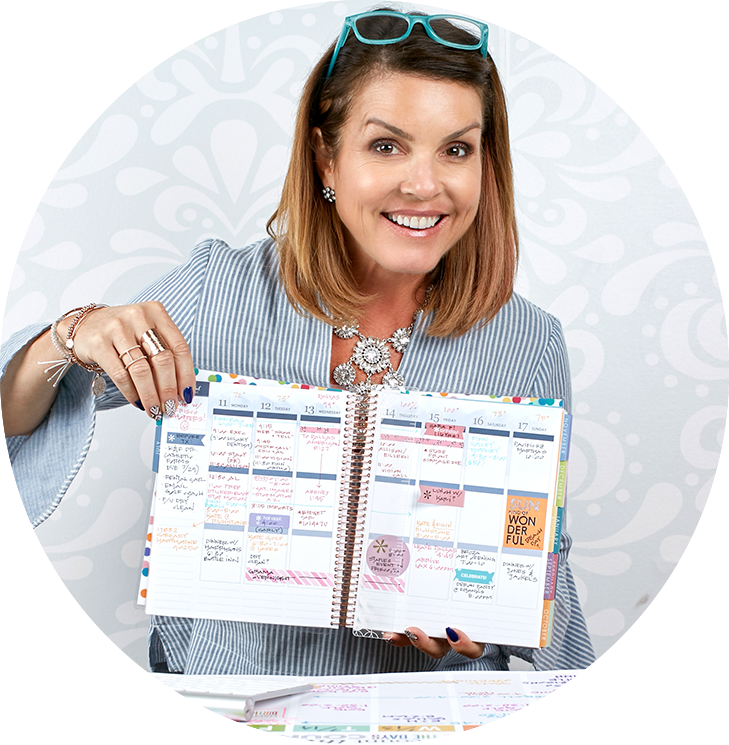 When she’s not switching gears from mom to business owner to wife to friend, Anna is coming up with clever ways to stay organized and is so excited to share some of those today! I have quickly learned that being organized is essential for me to stay on top of everything. In addition to the necessity of staying organized, the desire and the need for an inspirational workspace is a crucial part. I don’t know about you, but the second my work space gets cluttered, it seems to heighten my stress. There truly is something about having a clean, organized work space that keeps you calm and motivated. 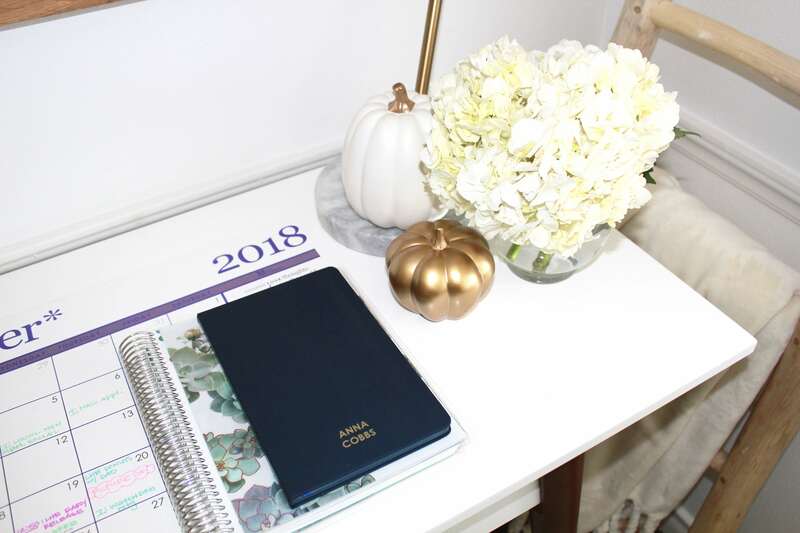 Today, I have the privilege of sharing with you guys my favorite organization tools and my 6 tips for decorating a workspace you love. Pick a Color Scheme – your office is your space. It’s your space to be inspired, to be productive, and to thrive. Pick a color scheme that suits you. For me, I stuck with neutrals and natural colors. It keeps me calm and focused. Light, Light, & More Light – studies have shown that natural light makes people happier and more productive. So, make sure your office has at least one source of natural light. For me, I went as far as positioning my desk right by a window to ensure maximum natural light. Feature Your Most Used Items – let your most used pieces be the hero of your desk. For me, that includes my monthly deskpad, which charts all activities for all 4 family members, my life planner, and pens. I use these products almost daily, so I want them out and readily available. Opt for patterns and prints that coordinate with your personal style. For me that is natural, neutral colors and patterns. The succulent pattern of my Erin Condren address book and clipboard coordinates with the print hanging above my desk. Declutter– having too much on your desk can add to your stress and decrease your productivity. I recommend keeping as little on your desk as possible.I do recommend however, keeping the items you use the most on or near your desk. For example, I don’t use my address book every day, but I use it frequently to record brand addresses for thank you notes. So, I keep it in the filing divider on my desk so that it is easily accessible. But, my extra pens, chargers, etc., those can go in a drawer. 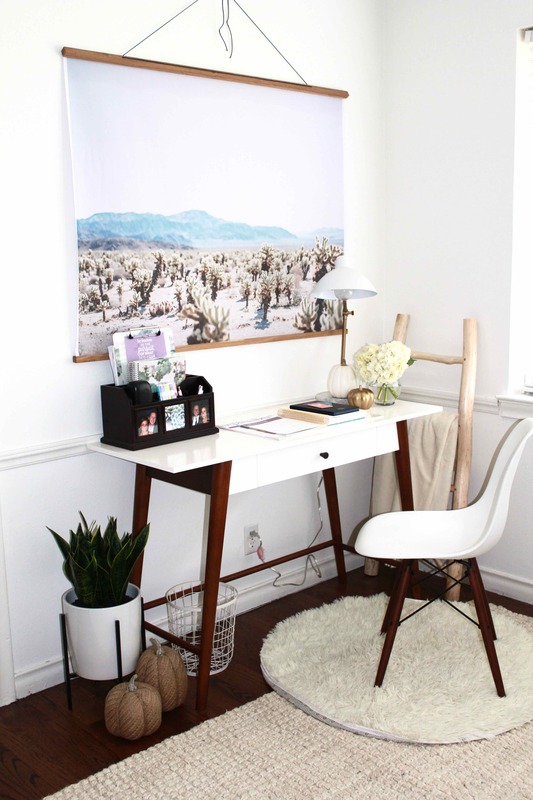 Add Something Natural – if you spend a lot of time in your workspace, you want to feel happy and inspired. Add something pretty to make you smile – flowers or seasonal items are my go-to. You’ll be surprised what a fresh bouquet can do! Invest in Pretty Supplies – this might sound crazy, but it’s one of my favorite parts of decorating my office. 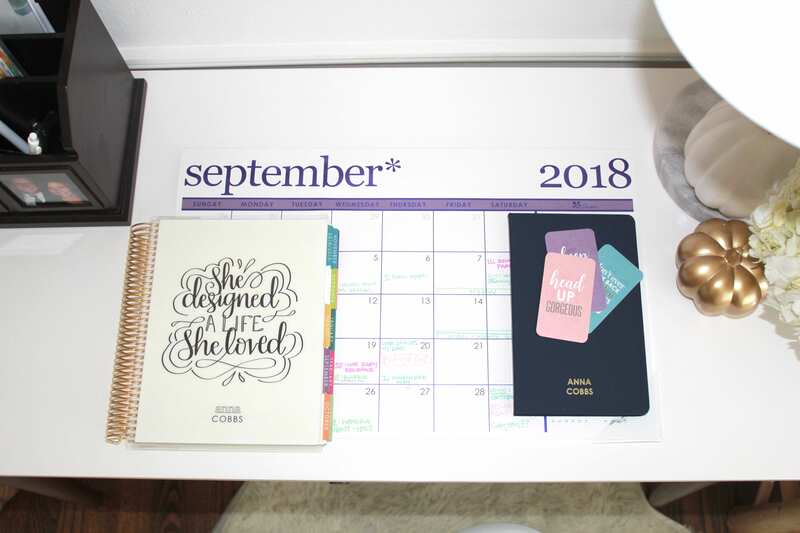 Choose office supplies – your calendars, journals, pens, etc., that are pretty. These are items you are going to be spending a lot of time with, so you want to get something that’s not only practical, but that’s fun and inspiring, too! I love the succulent print from Erin Condren, so I ordered that in several of my supplies. I love that it fits with the color scheme of my office, and it’s fun for me to look at. I actually get excited to use my office supplies! Alright! Thank you so much for joining me today and I hope you found some of these tips helpful! 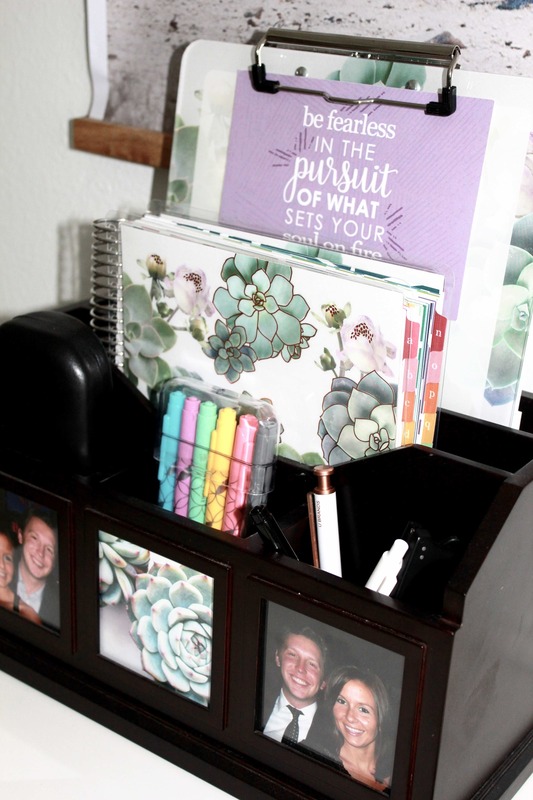 Be sure to use #ECorganization to show me how you styled your office! !